This Reunion Weekend bore the full spectrum of emotion and experiences for the class of ’18 as the completion of their leadership over FYOP came to a close, families swarmed the peninsula so see their cadets lead parade or undergo the obstacle course, and as we all got a chance to speak with the voices of the Old Brigade as we exchanged war stories (both literally in the sense of military life and figuratively in regards to the college life). 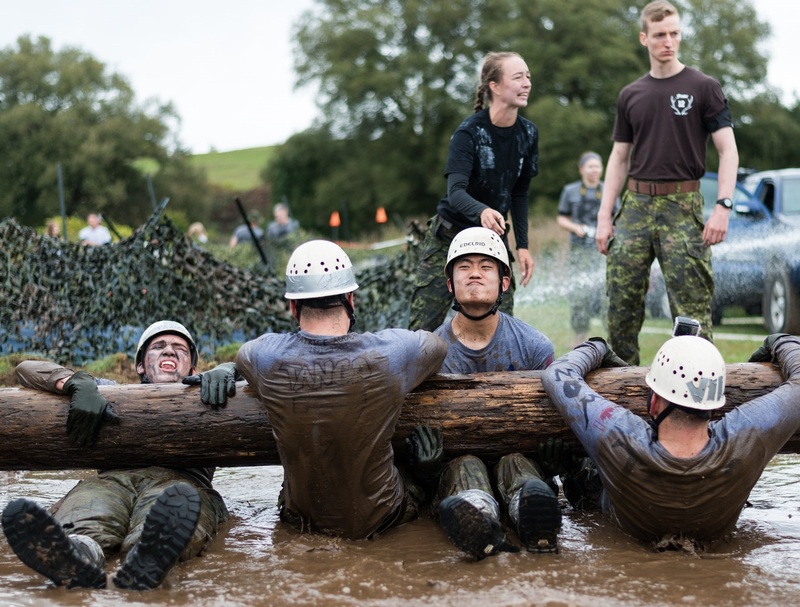 It seems that living through the fourth cycle of Obstacle course, Badging Parade, and the like, carries an entirely different kind of significance within an Officer Cadet’s career. For us fourth years, it is the fulfillment of a lot of hard work, team bonding, and immersion into military doctrine, and also the realization that there is yet one more year left with which to push through and make our greatest mark, perhaps greatest mistakes from which to learn, and also our greatest positive impact on the college culture. I was given the chance to attend the Legacy Dinner, where I sat across from Royal Roads, ex-Commandant 1984-87, RMC Club President 5440 Captain (N) (Ret’d) Tony Goode. It was an honour to be in such company, and he regaled us with tales of a young cadet mixed with life advice, a shared love of history and reading, and how his time in the military threw him into the tumultuous scenes of West Africa, the Berlin wall, and the North Korean wall at the height of their respective conflicts. The entire room indeed was filled with the legacy of great names and personnel—all ex-cadets, some of which included the current RMC Cmdt and Chris Hadfield, and as we spent the evening interacting with them we gleaned from them a model of leadership that never fails. Running alongside to cheer on our last group of first years hurdling through the obstacle course was inspiring, to think how only three years ago, that was us, and it’s almost like we could see how certain personalities always end up in certain squadrons, like s circle of rejuvenated RMC spirit that keeps the healthy competition of aspects like the obstacle course alive. Although everyone likes the idea of winning, the fourth years have truly come to care most about the motivation and teamwork that goes into the final product, so that no matter the result of the course for our ‘little sharks’, it was something we could all be proud of because they completed every obstacle with determination and resilience. Standing back in the band for the Badging Parade was also bittersweet, as it really is the culmination of past present future Officer Cadets, taking on the roles set by the Old Eighteen long ago. When the first years joined the wing I noticed how sharp is the optical illusion of red and blue patterned tunics lined up like dominos against the noble backdrop of Mackenzie tower’s clean slate grey limestone texture. It was a beautiful day, and I think a permanent blessing lies over the peninsula for reunion weekend. These first years have earned every second, and I hope to create a strong bond of mentor-ship and comradery with the last generation I’ll live alongside. Their beginning marks the start of my end at this college, but also sparks in my class the fire to go out blazing with all colours and the officer-like pride of belong to such an institution. 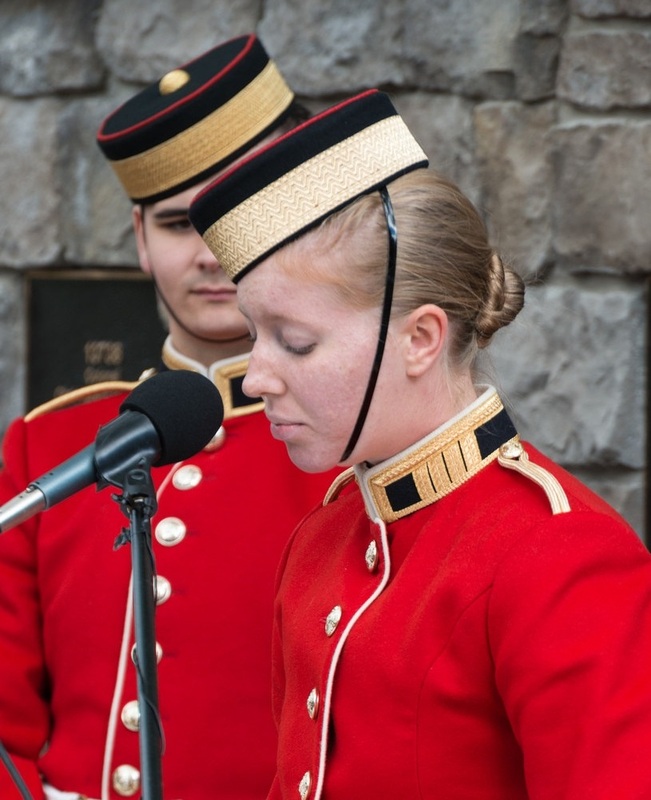 Attending the Wall of Honour Ceremony as one of the MCs for the first time at the college made me wish I had been free to spectate every year at the college, and those there for first time among cadets were also greatly impressed. It was a high profile audience, consisting of one of the honorees still living. 5576 Honorary Colonel Leonard Gordon Patrick Lee, founder of Lee Valley tools, was unveiled first by one of his surviving classmates, 5604 Ken Smee. H2652 Mr. Arthur Britton Smith addressed the audience on having been the second name added this year. Probably the most humourous and engaging speaker many of us had heard, the WWII vet stressed the point that in receiving the plaque it was mostly a tribute to his fallen comrades – as he was the sole survivor of his class that entered and fought in the war. 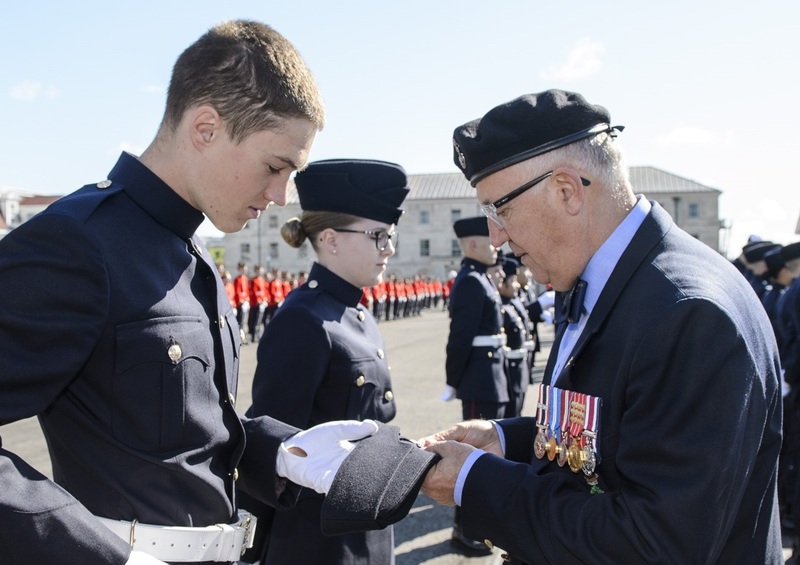 His personal connection to Lee Valley made the Officer Cadets in the audience fully appreciate the inter-generational nature of what keeps the RMC spirit and community alive—colliding timelines re-occur at RMC for the benefit of the upcoming leaders in the CF. Brit called this college “the greatest spot on God’s green earth,” and now that I see the Wall of Honour through different eyes I’d have to agree.